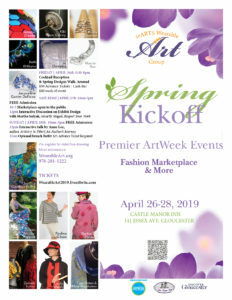 Gloucester, MA – The seARTS Wearable Art Group will usher in ArtWeek Cape Ann with a newly-designed event – a Spring Kickoff which runs the full weekend of April 26-28. 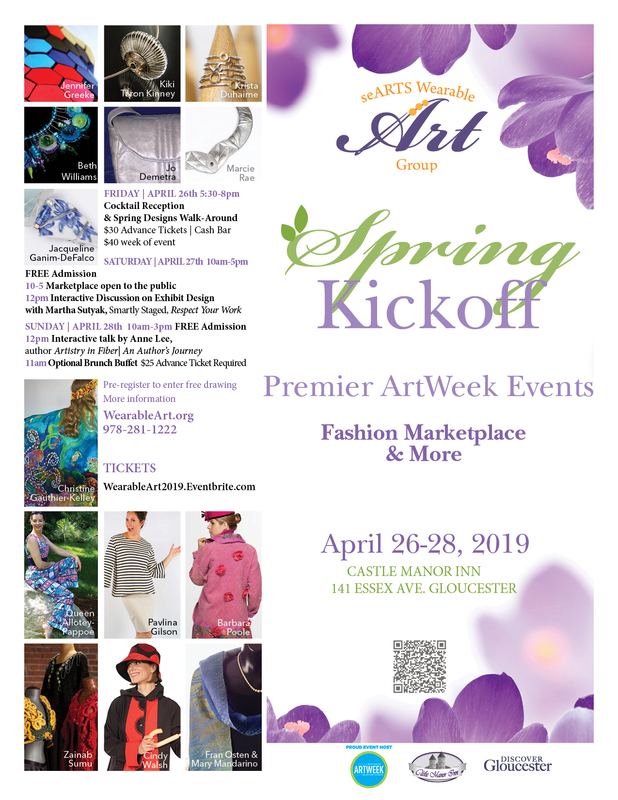 The core of the event is a wearable art marketplace housed at the Castle Manor Inn. The opening reception is Friday evening. For a $30 ticket ($40 after April 15th), attendees will enjoy a colorful evening that includes robust appetizers, a cash bar, and a first “look” at the artwork both on display and on local models wearing some of the artists’ spring designs. Opening night tickets here at Eventbrite! 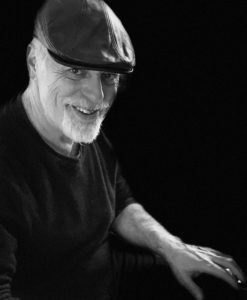 To add to the elegant atmosphere, John Hyde will share his musical talents on the piano. A native of Beverly, MA, John has been playing piano since he was a child. At Berklee College of Music, he majored in composition while studying classical piano under Ed Bedner. After graduating from Berklee, he was swayed by jazz and studied under Charlie Banacas and Paul Schmeling. John has performed with a multitude of bands as well as doing solo work. His performing, directing, and arranging spans many genres of music including Jazz, R&B, Blues, Cabaret and Classical/Liturgical Music. In addition to writing and performing throughout the Greater Boston area, John has a roster of private students of all ages, levels, and styles. The heart of the weekend is the Wearable Art Marketplace, which includes fourteen talented makers invited to show their work. Wearable art and fashion lovers will be enchanted by the variety of work from eight artists engaged in fiber and fashion and six focused on jewelry and accessories. There are several artists who have never sold their work on Cape Ann alongside returning artists, many of whom have new collections to share. (See full list at the end). Event chair Jacqueline Ganim-DeFalco encourages the community to visit throughout the weekend to enjoy the displays and shop. One of the goals of ArtWeek is to provide access to the arts in new ways that are highly accessible, affordable, and interactive. With that in mind, the Wearable Art Group will have many special events throughout the weekend. There are two signature events scheduled for noon on Saturday and Sunday. The first is an interactive session with Martha Sutyak on Saturday: ‘Respect Your Work| Show it Well’. On Sunday, Anne Lee will conduct an interactive talk and book signing: ‘Artistry in Fiber| Wearable Art – An Author’s Journey’. Both will present a unique point of view and provide the audience new insights as to how to present artwork in new and creative ways. Martha Sutyak resides in Beverly Cove (MA.) She is a freelance designer and partner of Smartly Staged and takes great pleasure in solving problems through design. She is an active volunteer, helping to curate the Celebrate Wearable Art Runway shows, moderating a panel of designers for the seARTS annual meeting, and styling events for the Spark Collective and other organizations. Anne Lee resides in Lexington, MA. She and co-author E. Ashley Rooney had been casually acquainted for many years. Together, they edited Encaustic Art in the Twenty-First Century as well as this groundbreaking series on fiber art, Artistry in Fiber: Wall Art (1), Sculpture (2) and Wearable Art (3). As research director at Vose Galleries, Anne researched and wrote over 20 exhibition catalogs. In addition, she has published articles with Fiber Arts Now, Art Quilt Collector, and the NBO Quarterly Review. She participated in the 2018 Wearable Art Salon, a panel discussion organized by seARTS and the Cape Ann Museum. seARTS is pleased to welcome both Martha and Anne back to continue sharing their expertise. In addition to these signature events, attendees will also enjoy “pop up” sessions with artists throughout the Marketplace hours on Saturday and Sunday. Jacqueline Ganim-DeFalco will have demonstrations on working with long hair and hair accessories while Queen will demonstrate how to create looks with African head scarves. All of the artists have donated gift certificates and drawing tickets are provided to all pre-registered attendees and also for each purchase made at the event. Below are the artists who will be available throughout the weekend in the Marketplace. Pavlina Gilson (Manchester, MA) designer, P R I E M L O V – creates a fashion collection embodying timeless elegance with a modern edge. Christine Gauthier-Kelley (Manchester, MA.) is a life-long artist and a Master Silk Painter creating her work at Ten Pound Studio Gloucester. Her fantastic one of a kind hand-painted silks will be featured at the show – pure elegance in shimmering evening wear dresses, shawls, scarves and jackets. Jennifer Greeke (Gloucester, MA) creates a collection under the name Harpy. Harpy is a jacket fashion company that is dedicated to creating unique clothing that explores high fashion, art and history. Fran Osten & Mary Mandarino (Gloucester and Newtonville, MA) have been showing their work together for many years. They create a variety of one of a kind scarves, shawls, wraps and other wearable pieces. Using yarns they dye themselves, their complex designs can be worn casually or for more formal occasions. Queen Allotey-Pappoe (Littleton, MA) is focused on Sustainability and Innovative design, Queen Adeline explores Color and Clean lines in creating modern, versatile and timeless pieces drawing inspiration from her African heritage. Zainab Sumu (Boston, MA.) Primitive Modern fashion combines the indigenous and avant-garde to showcase the diverse cultural wealth of North and West Africa. Inspired by a love of textiles, art, architecture, music, dance, African tradition and lifestyle, Zainab believes in an aesthetic where tradition, modernity and elegant imperfections collide. Barbara Poole (Lowell, MA) has been creating fashion felt accessories in the Boston area since 2003. Barbara creates one of a kind and limited production felted art to wear. The pieces may begin as the same shape and size, but Barbara approaches each piece as a unique work of art; even a simple scarf will possess its own vision. Cindy Walsh (Framingham, MA) designs and hand-makes outerwear and accessories. The fabrics are Polartec and rain wear embellished with appliques, piecing, stitching and embossing. Jo Demetra (Rockport, MA) designs and creates high quality “empowerment” tools. Some people refer to them as accessories. They include quilted, artistic, eye catching leather bags and bold, unique and sophisticated jewelry. Krista Duhaime (Keene, NH), Focal Jewelry Designs create jewelry made with components from vintage and antique film cameras combined with semi-precious stones and metals. 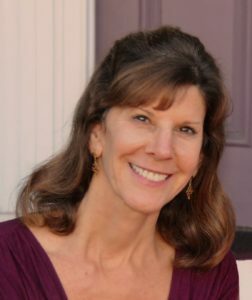 Jacqueline Ganim-DeFalco (Gloucester, MA.) under the umbrella Cape Ann Designs collection creates a full line of authentic sea glass hair accessories in jewelry. Jacqueline’s pieces are wearable art for all seasons. Kiki Taron Kinney (Marblehead, MA) is a metalsmith making handcrafted jewelry from high grade materials with specialized techniques. Inspired by nature, many of Kiki’s pieces have an aquatic theme. Marcie Rae (Gloucester, MA) Using Ancient and Contemporary techniques, Marcie Rae’s jewelry is hand fabricated in silver with precious and semi-precious gems, picture stones, pearls and beads. Beth Williams (Gloucester, MA.) creates art glass jewelry and beads in the Venetian tradition with a contemporary flair. Her collection is a kaleidoscope of color. Statewide champions include the Massachusetts Office of Travel & Tourism and the Mass Cultural Council, who also serves as ArtWeek’s Creative Communities sponsor. Additional support comes from the Greater Boston Convention & Visitors Bureau, the Foundation for MetroWest, DPA Communications, and Dartamon Consulting for technology services. 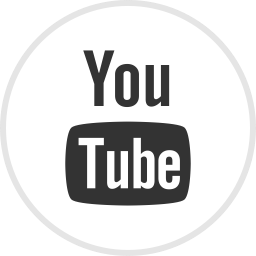 Lead Media partners include WCVB Channel 5, Entercom, AdSpace, Improper Bostonian, Boston Metro, Boston Central, Boston Globe, Bay State Banner, Cape Cod Community Media Center and the Massachusetts Convention Center Authority, as well as many others. ArtWeek’s expansion has also been powered by an extensive network of more than 110 creative collaborators at the statewide, regional and community level. 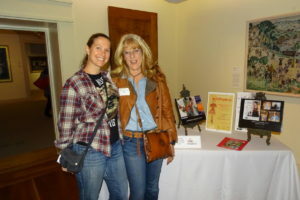 To learn more about the festival and its growth, visit www.artweekma.org.